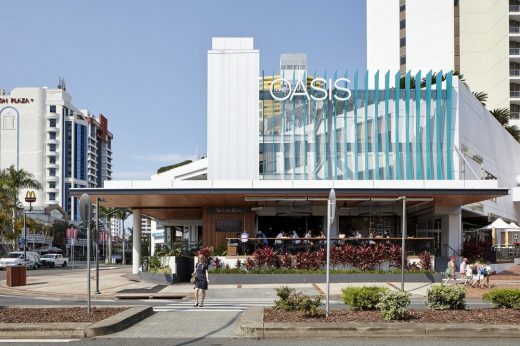 Australasian architecture firm The Buchan Group has unveiled the design details behind the new Broadbeach Mall dining precinct at the popular Oasis Shopping Centre at Broadbeach on the Gold Coast. The $8 million upgrade received a commendation in the City of Gold Coast 2017 Urban Design Awards announced in November. Held biannually, the awards celebrate Gold Coast projects that demonstrate high standards of design, liveability and sustainability. The Buchan Group, Lat27 and Hutchinson Builders were congratulated for their work on the upgrade of the centre’s outdoor dining precinct, which opened earlier this year and included a new awning structure, entry statement, paving, landscaping and lighting. 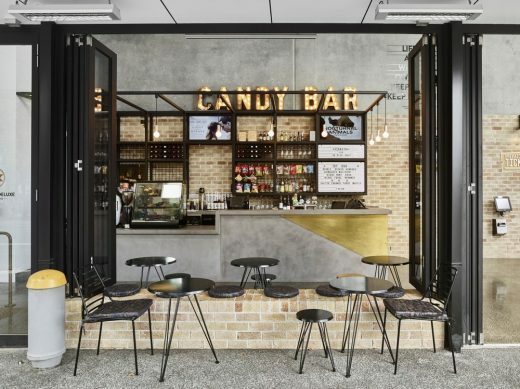 The Buchan Group Gold Coast Principal Brett Saville said Buchan’s architectural and design teams were appointed by the centre owners in 2018. 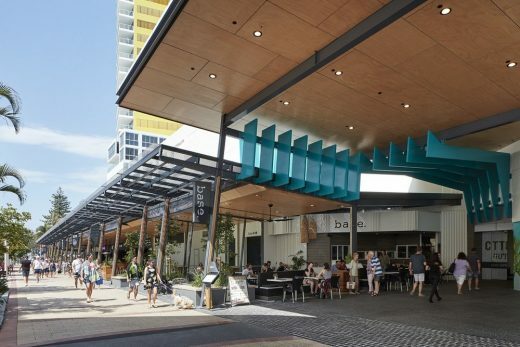 “One component of the centre masterplan that was prepared was to redesign the outdoor dining precinct at ground level facing Broadbeach mall,” Mr Saville said. 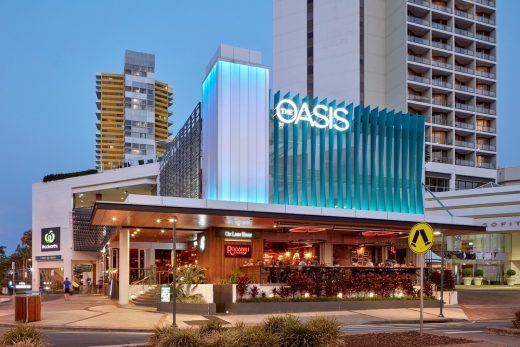 “Oasis is a 1980s retail and residential development that replaced the original Broadbeach International Hotel that first opened in 1955. 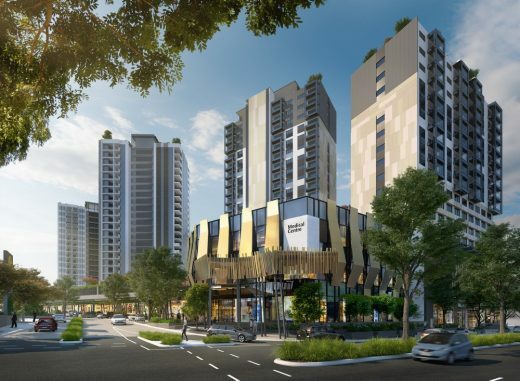 “The mall and shopping centre precinct is a popular destination for tourists and locals, and this work has invigorated a critical element of the central Broadbeach entertainment precinct. “Tenants along the southern entrance enjoy a retail location shielded from the south-east winds, with uninterrupted winter sun and easy pedestrian access via the mall frontages. Mr Saville said the main awning over dining places provided an open, airy environment while ensuring protection from rain via roll-down blinds. “This allows sun protection in summer while allowing an appropriate amount of sun penetration in winter,” he said. 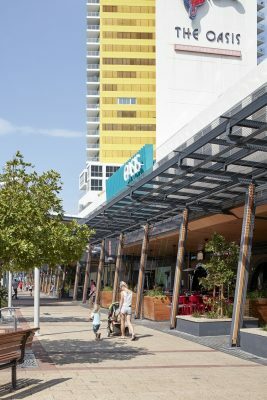 Flooring colours and materials were selected to complement the Gold Coast City Council’s streetscaping palette for Broadbeach, including painted steel, timber, glass and coloured concrete paving to accentuate a contemporary feel. “To further complement this, large planters with advanced trees feature, as well as quick growing flowering vines that climb vertically and will continue across the overhead wires under the glazed section of the awning structure.